Today I have a great secret recipe from Famous Dave’s that is perfect for a weeknight family meal. This country style roasted chicken is marinated and then seasoned with a flavorful spice blend. The result is a super juicy roasted chicken that tastes amazing. Your family will love it. Seasoning – combine- store airtight in pantry. Place the chicken in a 2 gallon sealable plastic bag. Pour a mixture of the Italian dressing and lemon juice over chicken, turning to coat. Marinate in refrigerator for 3 hours, turning every 30 minutes. Remove chicken from bag and drain. Season generously with 1/3 cup Roast Chicken Seasoning. Arrange chicken on a rack in a baking pan. Bake 1 1/2 to 2 hours or until a meat thermometer registers 170 to 180F, removing the tent 20 minutes before the end of baking process. Let stand for 10 minutes before carving. 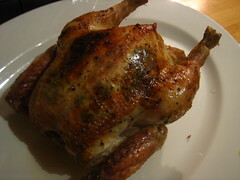 Today’s secret recipe (below) will teach you how to to make Famous Dave’s delicious country roast chicken at home. Just marinate, season and bake to juicy perfection. It doesn’t get much easier than that. I’ve also included the recipe for Famous Dave’s signature roast chicken seasoning. Mix all ingredients. Store in a covered container. Place the chicken in a 2-gallon sealable plastic bag. Pour a mixture of the Italian dressing and lemon juice over chicken, turning to coat. Marinate in refrigerator for 3 hours, turning every 30 minutes. Remove chicken from bag and drain. Season generously with 1/3 cup Roast Chicken Seasoning. Preheat the oven to 375 degrees F. Arrange chicken on a rack in a baking pan. Tent loosely with foil. Bake 1 1/2 to 2 hours or until a meat thermometer registers 170 to 180 degrees F, removing the tent 20 minutes before the end of baking process. Let stand for 10 minutes before carving. I wanted to share with you an amazing dessert that I made at home last night. This dessert combines fresh grilled peaches with vanilla bean ice cream. Have you ever grilled fruit before? It is no different than grilling a piece of meat. If you do not have a grill, you can use a grill pan on your stove. I love to order this dish at Famous Dave’s but with how easy it is to prepare, I make it at home whenever peaches are on sale. Mix vinegar and honey in medium bowl, add peach halves, toss to coat. On medium heat, grill peaches for 4-6 minutes or until soft – baste with excess sauce as you grill. Serve warm over vanilla bean ice cream, drizzle with caramel sauce and garnish with a fresh mint leaf. 1) 5 Odd Foods that KILL Abdominal Fat. 2) Enjoy Fresh Live Lobsters At Incredible Savings. New England gifts overnight. Guaranteed to crack a smile! Pre-heat oven 350-degrees. Blend melted butter, sugar, dark corn syrup, eggs, vanilla and kosher salt. Once combined, add chopped pecans and whole pecans. Pour this mixture into frozen pie shell. Put on cooking sheet. Cook for about 25 minutes, rotate and bake another 20-25 minutes. Let the pie cool down before serving..